Funny observation I have about a deviation of the English language from its present state in Great Britain to its present state in the United States: only one side of the pond seems to still use the suffix “monger” for anything of than “fear monger.” In the US, we have “fear mongering” — the act of spreading exaggerated rumors to create fear, however in Great Britain, there are fear mongers, and fishmongers and cheesemongers and I imagine lots of other mongers that I just didn’t have the time to observe from my time in Scotland. For a good period of my life, I’d like to say I was a bit of a cheer monger. My perpetual mental state was incredibly optimistic and, maybe my parents did a good job of teaching me proper sleeping habits, I tended to wake up like a happy Disney princess on coronation day. And while some of the folks who know me in the present might consider me to still be a mostly happy person, I am quite certain it is no longer a consistent state of being. I’m no longer a cheer monger, so much as a hopeful optimist who consistently feels like a let’s-just-survive-today realist. A few years ago, I met an individual on a few separate occasions that I can only liken to a wet blanket. Our conversations were so heavy and dry and it seemed like there was no space in the world for the possibility of flowers, sunshine, rainbows, or even rainbow colored Skittles candy. In the church, my friends, it just shouldn’t be so. I’m fascinated by this one simple thought: Jesus was telling His disciples to take courage, to be of good cheer… the Greek word translated there is defined as “be bolstered from within.” And this isn’t a stand-alone instance. At the most sorrowful point in His life on Earth Jesus keeps speaking this same idea: Yes, the road ahead will be hard. Yes. You will have tribulation. But rejoice. Take heart. Be courageous. Be of good cheer. Is there hope for a society riddled with trendy sarcasm? Is there hope for us to endure what life will throw our way and not just “grin and bear it” but embrace it, and find joy right here, right now? For the month ahead, I’d very delightedly like to invite you to join me on a journey to ask the question: how do we find a place in ourselves where we can be of good cheer in the midst of the hard? What if there’s another place: Moving even past the contentment we’re working on embracing into a place where we see what’s ahead and, no matter what, say “Yes” with a smile? A real one! I welcome your thoughts, comments, smiles — and even wet blankets, friends. Happy Easter. He is risen. 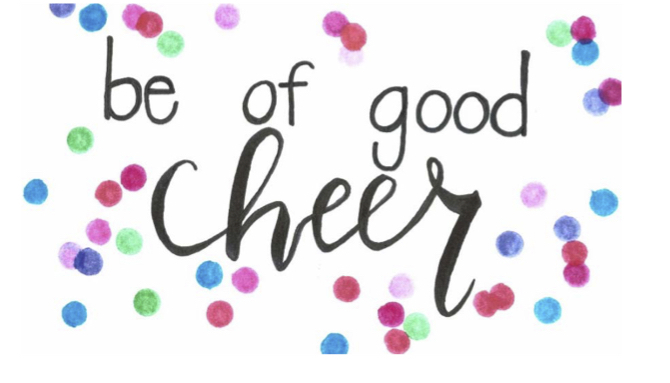 Be of good cheer! I'm so glad you're here. This is a space for souls that could use a bit of quiet and a full cup of encouragement. I hope you'll breathe deep, and know that you are so rare, so precious, such a treasure. I'd be honored to share words with you, in hopes that they'll bless your heart.